A lot of the discussion about last week’s MBA Mondays post on Outsourcing was about the differences between outsourcing locally and outsourcing outside your home country. A popular term for the latter approach is offshoring. The advent of modern electronic communications has allowed companies to efficiently source and manage labor all around the globe. This is one of the megatrends, if not the megatrend, of the current economic period we are living in. But just because you can use labor halfway around the world doesn’t mean you should. This post is about the pros and cons of offshoring from my perspective. On the plus side, offshoring often offers considerable cost savings. Labor costs in emerging markets are often a fraction of the labor costs in the developed world. And you can often tap into highly educated and skilled labor pools. We have companies in our portfolio that have built world class engineering teams in places like Belarus, Solvenia, and India. These teams cost less and often produce amazing work. AVC community member Ken Berger has been involved in building a strong team of ruby engineers in Vietnam. I have no doubt that team can do excellent work at a fraction of the cost of a team of ruby engineers in San Francisco or New York. On the negative side, there are significant communication and management issues that arise when you have a team working half way around the world for you. Yes, you can Skype, IRC, Twitter, and IM all day long with your remote team. But often they want to be asleep when you want to be awake. Israeli tech teams are well known for their participation in critical product/tech meetings with their US counterparts in the wee hours of the morning. They might be in the meetings, but you have to wonder if they are at their best. But as problematic as the communications issues are, the management issues are even harder. You can outsource the management issues by hiring a firm to do your work for you. I am not a big fan of that approach, particularly for startups. As I outlined in my post last week, I believe startups need to directly employ the people doing the most critical tasks. And for a startup, that includes things that are commonly offshored like software engineering and customer support. And even if you outsource the management to an offshore firm, you will have to manage that firm. And managing vendors is often harder than managing employees. I have observed that hiring a local manager for a remote team is often the hardest thing to do. And you need a strong manager in place in your remote location if you are going to be successful. 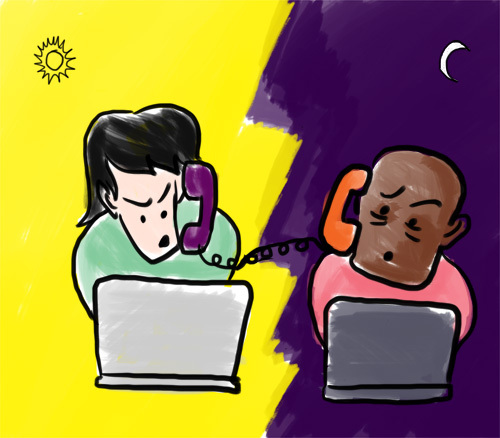 A weak manager of a remote team is almost always a disaster for your company. It causes delays and management messes that you will have to clean up. The most reliable technique I have observed is to ask a trusted and experienced team member to go overseas and launch/manage the remote team. That is a big ask and often is not possible. But if you can make that work, it has the highest probability of success. The companies in our portfolio that have done the best job with teams located in other parts of the world have had founders who came from those places or founders who spent significant time in those locations. They are able to source high quality talent and manage them, sometimes even remotely due to their familiarity with the people, place, and culture. Speaking of culture, you can’t overemphasize what a big deal it is having multiple cultures in your company. Some cultures take it easy in the summer and work hard in the winter. Some cultures have different approaches to gender in the workplace. Some cultures value respect more than money. Some cultures value money more than respect. Multiple cultures can often create tensions between offices and teams. Managing all of this is hard and I have not seen many do it exceptionally well. But I have also observed that as this kind of organization structure gets more common, entrepreneurs and managers are getting better at handling cultural complexity. The single most important thing you can do is get everyone, at least all the senior team members of the company, across all geographies, together on a regular basis. And I think it is not a good idea to always have the remote offices come to the home office. The home office needs to travel to the remote offices too. As I said at the start of this post, being able to source and manage talent all across the globe may be the signature megatrend of the current economic period. It has far reaching consequences for companies of all shapes and sizes. For startups, it offers lower costs and at times access to excellent skills and talent. But it comes with great challenges and you should not undertake an offshoring exercise lightly. With offshoring, one thing is true: know exactly what you need done. If you give a team in India a task that is vague, you’ll get back results that are wrong. With traditional “outsourcing”, your conclusion is dead on. But sorry folks, can’t agree with that generalization. This is exactly what Agile is about. With Agile development, you don’t need to know your exact requirements or specifications in advance. That’s why Agile is so talked about and increasing in popularity among startups these days. It is NOT so easy to pull off though, particular overseas, so be careful. I agree with this completely. Having teams that understand and follow Agile ideals and process well will be a huge help. Having someone on site who shares the vision for your startup and can make meaningful, fine grained product design decisions on your behalf, and who can manage the team the way a technical cofounder would, is independent of the software process and is more what Fred is talking about. This article was originally written by Fred Wilson on September 20, 2010 here.